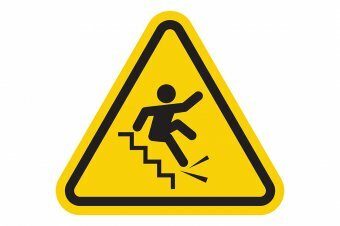 Most commercial landlords, building owners and managers of public spaces fully understand the risks of customers and the public, slipping on a staircase, particularly amongst the elderly or very young. Here we look at the difference anti-slip stair nosing can make to the stair safety. We recommend the Anti Slip Heavy Duty Stair Nosing for areas that are expected to have a high footfall usage. Our anti slip stair nosing has been specially developed to endure very high levels of footfall and delivers a tough anti slip stair edging for additional safety. These anti slip stair nosings have been created for both internal and external use, being capable to withstand wet conditions. This style of Anti Slip Heavy Duty Stair Nosing is an ideal metal stair edge for public areas. In addition, the interlocking system allows for further extension for wider stairs and are also manufactured for use as a retro fixing. It is important that any stairs have the provisions and installations made to help disabled people, including those who are visually impaired that are visiting the building. Therefore the stair nosing should deliver a sufficiently strong visual contrast with its surroundings. This will include colours as well as taking in to consideration light reflection. The addition of heavy duty anti slip stair nosing provides excellent durability levels for high footfall areas. This will support the long term health and safety of the public areas whilst lowering repair and maintenance requirements of the stairs that have been fitted with the metal edging. If you need any assistance to help you select exactly the right type of stair nosing, we can provide you with all the information you need, whist working closely with you during the initial planning stages of your project. We are also on hand to help you if you are looking for a stair nosing retro fix. Simply give us a call you would like to discuss a more specific requirement, we’ll be more than happy to help.